A molecular study carried out on the chestnut gall wasp (Dryocosmus kuriphilus), a chestnut tree parasite, has revealed the absence of genetic variability in this invasive species in Europe. This is due to the fact that the wasp's reproduction is strictly parthenogenetic—the females produce more females without fertilization by a male. This is the main conclusion of the research, published in Scientific Reports. The study was arried out by researchers from the INDEHESA Research Institute of the University of Extremadura, the University of Córdoba, CREAF and the CSIC-UCLM-JCCM Hunting Resources Research Institute. "It is very likely that the chestnut gall wasp population originates from very few females which were accidentally introduced into Italy via infected plant material brought from China in 2006. As a result, their genetic diversity is null in the genes we have analysed," explains researcher Raúl Bonal of the University of Extremadura. The researchers have genotyped wasps collected in affected areas of Andalusia. Specifically, they have sequenced and screened five genes (three mitochondrial and two nuclear) and compared them to the sequences of other individuals collected in other invaded areas in Europe and from their natural distribution area in Asia. The results show that in the invaded parts of Europe, the populations are genetically homogenous, resulting from one or a few individuals. According to Bonal, no males of this species have been recorded so far, and the high capacity of proliferation and reproduction of the females, which "clone" themselves, producing genetically identical daughters, give this insect a high invasive potential because a single specimen can give rise to a large contingent of invaders in a short space of time. The rapid invasion of the chestnut gall wasp is causing considerable economic and ecological damage in the European chestnut sector. "Prevention is the best weapon we have at present, bearing in mind that the wasp propagates from one area to another via grafts," says the UEx researcher. This insect, which is the size of a grain of rice, oviposits on the buds of chestnut trees, but cannot be seen with the naked eye. The leaf buds open the following spring and the larvae begin to develop. 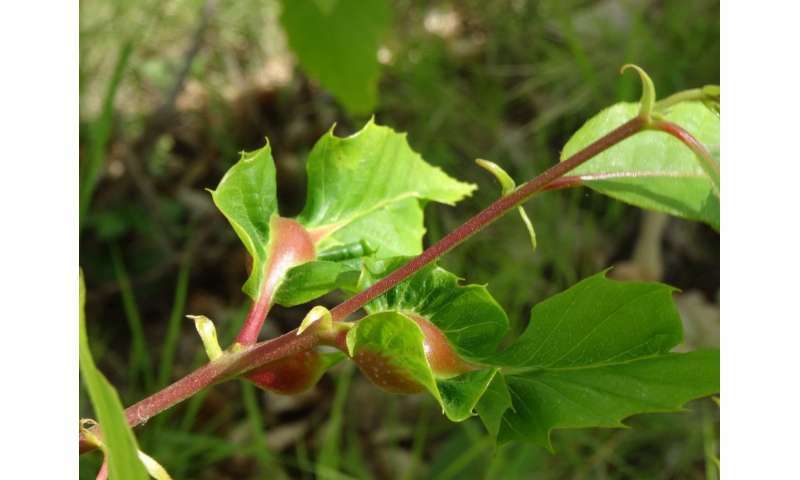 During this process, fleshy galls form on the leaves and shoots of the tree and the larvae feed inside them. "These galls are a malformation, similar to a tumour, because the cells reproduce abnormally in this area. Consequently, the tree has fewer leaves For Raúl Bonal, the most effective solution is the simplest one. "Since the eggs cannot be seen, people take the infection with them in the seedling and we are taking the enemy home with us. As a result, before selling the plant the nursery should keep it in quarantine for at least one year to ensure that the plant has no galls. In this way, the plant sprouts in controlled conditions." In the areas of Spain that are still wasp-free, the safest thing to do is not bring any plants or cuttings in from outside the area, and if you do, it is advisable for individuals to keep them under observation for the first year as the new leaves form in spring. If the sapling or cutting shows symptoms (fleshy balls), they must uprooted, taken home and burned. This must be done whilst the larvae are still inside the gall, because when the adult wasps leave the gall in summer, they begin their reproductive stage and it will be almost impossible to control the invasion. In the north of Caceres province, for example in Villuercas, La Vera and the Jerte Valley, where chestnut cultivation is extremely important for the local economy, invasion alerts have been cut short over the past two years, but the researchers warn that people should not let their guard down.